At last year’s European Social Forum, Bernie McNally and Margaret Unwin, two victims of the Dublin Monaghan bombings of May 1974, gave an impassioned call for a public inquiry into the atrocity to a packed meeting organised by the Connolly Association. Here, the Irish Democrat reprints their speeches in full, including disturbing evidence of collusion by British forces in the bombing. "ON FRIDAY, 17 May 1974, at 5.30 pm, three no–warning car bombs exploded in Dublin City Centre — in Parnell St., Talbot St., and South Leinster St. An hour and a half later, at 6.58 pm a fourth no–warning car bomb exploded at North Road, Monaghan town. As a result of the bombings, 34 people (19 women, 2 baby girls, 1 unborn full term baby and 12 men) lost their lives and hundreds more were injured. I was counted among the injured and remained in hospital for six weeks afterwards. To put the bombings into the political context of the time — they were planted on the third day of the UWC strike against the power— sharing Executive, which had been established as a result of the Sunningdale Agreement. The bombings were almost certainly aimed at preventing a greater role for the Irish government in the administration of Northern Ireland. There was a precedent for bombing Dublin at politically strategic times. 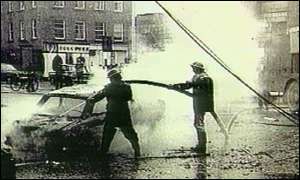 The first car bombing of Dublin occurred on 1 December 1972 when the Amendment to the Offences against the State Act was due to be voted on in Dáil Éireann. The Amendment looked set for defeat but, in the immediate aftermath of the bombings, the Fine Gael party changed their mind and the legislation was rushed through both Houses of the Oireachtas during the following day. The legislation was designed to give the Gardaí more powers against the IRA. From the viewpoint of the bombers the Dublin and Monaghan bombings were equally successful. After the fall of the power–sharing Executive on 28 May 1974, the Irish government did not involve itself in the affairs of Northern Ireland for several years. The attack itself was cold blooded and premeditated murder, aimed at the civilian population, designed to claim the maximum number of lives. These were no–warning car bombs set to explode at the busiest hour of the busiest day of the week — 5.30 pm on a Friday evening. This was not a case of failed or inaccurate warnings and it is likely that many more would have died but for the fact that a bus strike prevented many shoppers from getting into the city. In the immediate aftermath of the bombings, the Irish government appeared to adopt a fatalistic attitude. The taoiseach, Liam Cosgrave, made an extraordinary speech to the nation on the evening of the bombings in which he suggested that "any person who ever practised violence or preached violence or condoned violence must bear a share of responsibility for today’s outrage". Speeches by the minister for justice, Paddy Cooney, the minister for posts and telegraphs, Conor Cruise–O’Brien and the attorney general, Declan Costello, endorsed this view that the victims, that is, the citizens of the Republic of Ireland, were to blame. The attorney general went so far as to state that any Irish citizen who had even entertained the thought of supporting the IRA’s campaign, was every bit as guilty of the slaughter of the victims of Dublin and Monaghan as those who had planned and carried out the atrocity. The bombings disappeared very quickly from all organs of the media and from public consciousness. A long and deafening silence prevailed. There was no national day of mourning, as there had been after Bloody Sunday, no government initiative to set up a fund for the dependants of those murdered, no progress reports were provided to the families by the Garda Síochána, there were no questions from the Opposition in the Houses of the Oireachtas, there were no questions raised by any section of the media, there was collective amnesia among the citizens of the capital city and the country at large. No head was raised above the parapet to call for justice for the victims; the bereaved families and survivors were not just abandoned but were cast aside by the Irish authorities. When I returned to work on Talbot Street, it was as if the bombings had never happened. Although the owner of the shop where I was employed, like me, had been seriously injured, we never spoke about the atrocity and tried to get on with our lives. The great silence lasted for 16 years — until 1990. In that year, there were small stirrings. A retired Irish army officer wrote articles in an Irish language newspaper, detailing his analysis of the bombings; a journalist put forward similar views in a magazine and a trade unionist was finally successful in persuading Dublin City Council to erect a very modest memorial to the victims. The unveiling of that memorial in 1991 led to families and survivors coming together for the first time. Yorkshire Television (YTV) were contacted and became interested in the issue. Their investigative journalism resulted in the screening of the documentary: Hidden Hand, the forgotten massacre as part of Channel 4’s First Tuesday series. The main findings of the programme were that, at least some of the suspects were members of the UVF; the UVF acting alone, did not have the capacity to carry out these bombings; the bombings bore the hallmark of a sophisticated and technical operation and the Garda Investigation was wound down after three months. Hidden Hand was the catalyst for the campaign that has continued since that July evening in 1993. I would like to pay tribute to the producers of that programme who had the courage to do what Irish journalists and Irish television failed to do. During the six years following the screening of the programme, many doors were slammed in the faces of the relatives. The government refused to set up a public inquiry into the allegations made on the programme. In 1996, the two lawyers who still comprise our legal team came on board the campaign. They took a case against the United Kingdom government to the European Court of Human Rights because of the failure of the Royal Ulster Constabulary to initiate a murder inquiry into the bombings. To assist the case they sought disclosure of the Garda investigation files. The High Court denied access to the Garda files and that decision was upheld by the Supreme Court. Then the ECHR judged that the complaint against the RUC was time barred. The RUC failed to set up a murder inquiry even though the men who planned and executed the Dublin and Monaghan bombings did so in their jurisdiction, the no–warning bombs that caused the death of 34 civilian men, woman and babies were assembled in their jurisdiction, the cars used to carry the deadly cargo, as well as the getaway cars, were procured in their jurisdiction and the perpetrators, when their terrible deed was done, escaped back safely to their jurisdiction. Eventually, in December 1999, we negotiated with the Irish government and agreed to accept the Independent Commission of Inquiry, originally under the chairmanship of Judge Liam Hamilton and later under Judge Henry Barron. After four long years, the Barron report was finally published last December. The British government failed to co–operate with the Inquiry in any meaningful way. Not one single original document (or copy of such a document) was furnished to Judge Barron — all he received after months of prevarication was a ten–page letter on 26 February 2002. Barron concluded that the material assessed by the inquiry was insufficient to suggest that senior members of the security forces in Northern Ireland were in any way involved in the bombings. From January to March of this year (2004), public hearings into the Barron report were held before the Joint Oireachtas Committee on Justice, Equality, Defence & Women’s Rights. This gave an opportunity for the bereaved families and survivors to have their voices heard in the Irish parliament and I, along with many others, welcomed the opportunity to tell my story. At the end of the hearings, the committee recommended that, internally, the Irish government should establish an inquiry into the reason for the premature winding down of the Garda investigation, the failure to follow up specific leads and the missing files. They recommended that the Inquiry should be set up under the new Commission of Investigations Act. The government has announced that it will establish such an inquiry. However, we are unhappy with this type of Inquiry as it is, effectively, a private Inquiry. Barron was devastating in his criticism of the Garda investigation and the response of the Irish government of the day and also of the fact that, currently, important files are missing in the Department of Justice and Garda Síochána. We learned a lot of new information about the collapse and apparent ineptitude of the Garda investigation — its failure to use the information it had obtained; failure to pursue leads; bungling and delay in sending forensic samples to the laboratory, etc. However, in relation to the collusion aspect, while acknowledging the paucity of the information received from the British government, we believe that Judge Barron could have attached greater significance to material he did receive, in particular, from Fred Holroyd, from Colin Wallace and from John Weir. During the course of the four years' inquiry, the lawyers for Justice for the Forgotten, with myself as researcher, carried out almost a parallel investigation, albeit with no access to official files. However, we met with anyone with any information anywhere. We travelled many times to Britain and to Northern Ireland, as well as further afield, to interview people. One of those who came forward to give information was a concerned Dublin citizen called Roger Keane who reported suspicious activity in Dublin on the afternoon of the bombings involving a British army officer and a van. Roger was in the company of two Gardaí when they searched the van at Dublin port on the evening of the bombings where they found a British army officer’s uniform. Judge Barron had confirmation of this from an Irish army intelligence report, which stated that a British army officer was taken off the boat by Gardaí and weapons were found in his bag. However, he found no reference to this episode in Garda records. A man who gave us detailed information over several meetings was Colin Wallace. Between 1973 and 1975 Wallace served as senior information officer (psy–ops officer) in British army HQ in Lisburn. However, we believe his most important evidence rests in the primary sources of his contemporary letters to his former superior, written in August and September of 1975, 15–16 months after the bombings. These letters are evidence that British army HQ had knowledge of several named loyalist paramilitaries in the bombings — at least one of these, Robert McConnell, was a serving corporal in the UDR. The letters are evidence that British army HQ were aware that these persons were working closely with RUC Special Branch and with the intelligence services. The letters appear to corroborate John Weir’s claims of a gang of security force members and loyalists working together as a pseudo–gang. Weir’s description of the network in which his group operated is identical to the group Wallace refers to as the ‘Protestant Action Force’. The letters suggest that this gang was linked to a special duties team at British army HQ, Lisburn. The letters confirm that the British army was privy to information that "the Dublin and Monaghan bombings were a reprisal for the Irish government’s role in bringing about the Executive". The Wallace letters are based on knowledge acquired by him in 1974 when he was at the heart of military command in Northern Ireland. Capt. Fred Holroyd was military intelligence officer with responsibility for RUC J Division, which included Portadown and large parts of mid–Ulster. He was under the command of Three Brigade, whose HQ was in Lurgan. He was also working for MI6. He, likewise, confirms that many of the loyalist suspects for the bombings were working for RUC Special Branch. He refers to Four Field Survey Troop, whose senior officers were Tony Ball and Robert Nairac and mentions that they reported to a special duties team at Lisburn. * That the explosive devices in Dublin were beyond the known competence of Loyalist paramilitaries. * That the explosive substances in Dublin contained as their main component re–crystallised ammonium nitrate. * That the re–crystallised ammonium nitrate was likely to have come from IRA stocks. * That, as the IRA could be ruled out as the perpetrators of the bomb attacks, the explanation for use of such explosives was that they came from British army stocks of seized explosives. * That the bombings in Dublin were out of character with known loyalist bombings of the time. * That there were a limited number of persons in the British army as it operated in Northern Ireland, who had access to the secure repositories of seized IRA explosives and they were the Ammunition Technical Officers (ATOs) of the different brigade areas. Having received many written submission and heard orally from Nigel Wylde, Colin Wallace, the Pat Finucane Centre, the Irish National Congress, the Irish Council for Civil Liberties and many other persons and organisations during the course of their examination of the Barron report, the Joint Oireachtas Committee reached stronger conclusions that Judge Barron on the collusion aspect. It is their stated view that the suspicion that collusion existed in Northern Ireland between members of the security forces and loyalist paramilitary groups in relation to the Dublin and Monaghan bombings, far from being dispelled, has been reinforced by this further information. They recommended that a Public Tribunal of Inquiry be established in Northern Ireland or Great Britain to investigate this issue, but before such an inquiry should proceed, an investigation based on the Weston Park proposals should be set up. We understand that the taoiseach (Bertie Ahern) has already discussed this with the British prime minister and is awaiting a response. However, we feel this a further delaying tactic. What we require, after 30 years, is the immediate establishment of a joint public tribunal of inquiry to be established by the Irish and United Kingdom governments to examine all aspects of the Dublin and Monaghan bombings." # posted by SAOIRSE32 : 10:07 p.m.